Cook, 34, who was knighted in the Queen's New Year Honours list, scored his 64th first-class hundred against Cambridge MCCU at Fenner's. 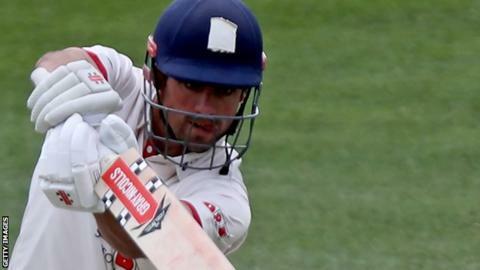 He reached his hundred before tea off 200 balls and was 150 not out when Essex declared on 387-5. England's record run-scorer bowed out in September with 147 against India. Cook hit 21 boundaries off the student attack and shared a fourth-wicket stand of 217 with Adam Wheater, who made 130 off 162 balls, including three sixes. There were five other century-makers in games being played by counties against university teams in preparation for the start of the 2019 Championship season on 5 April. England one-day captain Eoin Morgan made an unbeaten 61 off 69 balls for Middlesex against Oxford MCCU at Northwood, with Stevie Eskinazi retiring on 125 and Dawid Malan contributing 54. Toby Roland-Jones then claimed an Oxford wicket with the new ball after missing almost the entire 2018 season because of a back injury as the visitors closed on 24-2. The highest score of the day was James Hildreth's unbeaten 158 for Somerset against Cardiff MCCU at Taunton, while Durham's Will Smith finished with an unbeaten 148 in their 331-7 at the close against Durham MCCU. At Derby, Harvey Hosein (a career-best 138 not out) and Wayne Madsen (123) added 187 for the fifth wicket as Derbyshire reached 398-5 at stumps against Leeds/Bradford MCCU.